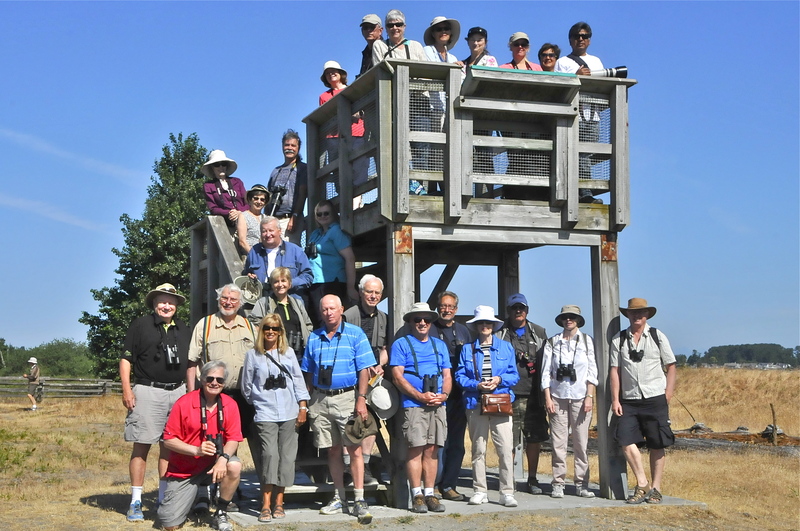 About 33 folk enjoyed a glorious Wednesday morning on our quarterly DNCB “Birds on the Bay” outing at Boundary Bay Regional Park (BBRP). Although bird sightings were at a premium, there were some pretty flower sightings, beautiful vistas, and the post-walk “snacks” were unbelievably scrumptious. 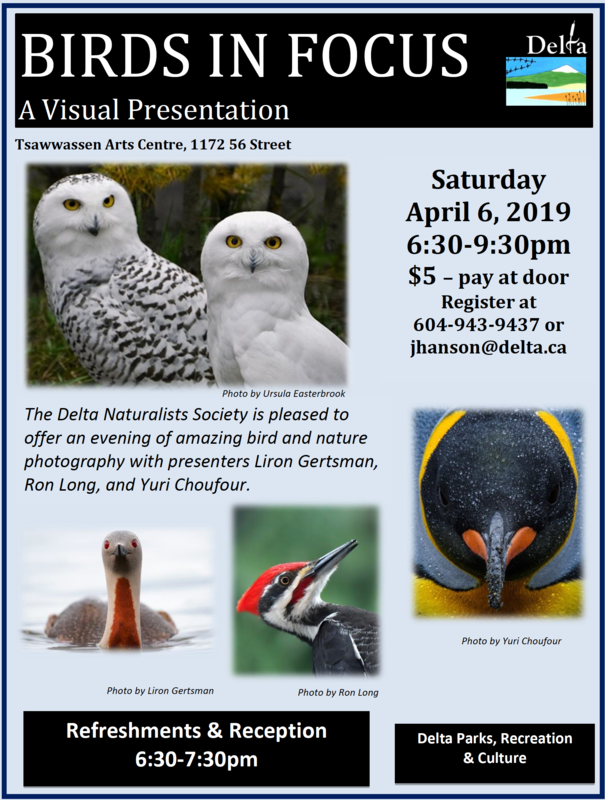 Check out the photo evidence by Photogs Ken, Pascale & Alberto, Glen, Jim K, Terry (and hopefully others soon) on our DNCB Picasa site. We met at and left from historic Cammidge House (CH) at 9:00 a.m. Following introductions of several “Newbies”, we strolled along the road toward the park and Centennial Beach. It was warm and very comfortable, but very quiet birdwise. A few Bald Eagles made fly pasts, House Finches and Northwestern Crows were noisy and common. The newly-planted native plants around the Park pond were nice, but the pond itself only had Mallards in it and we didn’t even see any resident Brewer’s Blackbirds. 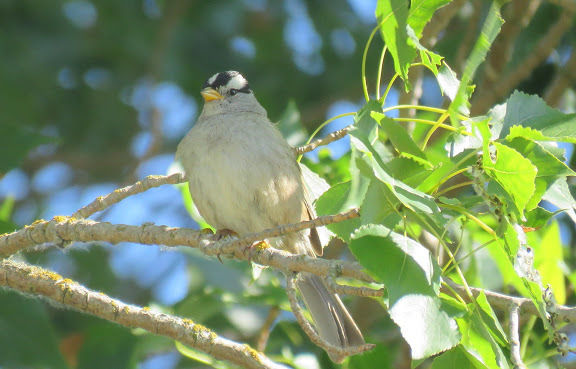 Anne found the singing White-crowned Sparrow in a tree which gave us some brief entertainment. Across the sandy beach, the tide was way out, so no waterfowl or shorebirds close by. Lots of Great Blue Herons and Bald Eagles (and Glaucous-winged Gulls) in the Bay along the horizon. White Rock, Mt. Baker and Coastal Mountains were dazzling in the distance. We walked the trail past the restaurant, listening along the shrubs. Marsh Wrens were singing and we finally saw one or two on their cat tails. Lots of Red-winged Blackbirds too. Northern Harriers occasionally flew by and a Red-tailed Hawk was being harassed by crows. Savannah Sparrows were plentiful and keen for phot ops on fence posts and logs on what else but the “savannah”. We heard several Common Yellowthroats and finally saw a couple of colourful males. Lots of Brown-headed Cowbirds around which we hope lay their eggs in the House Sparrow nests and not the Warblers nests. Herding the group onto the Lookout was uncommonly easy and Ken took the mandatory Group Photo. 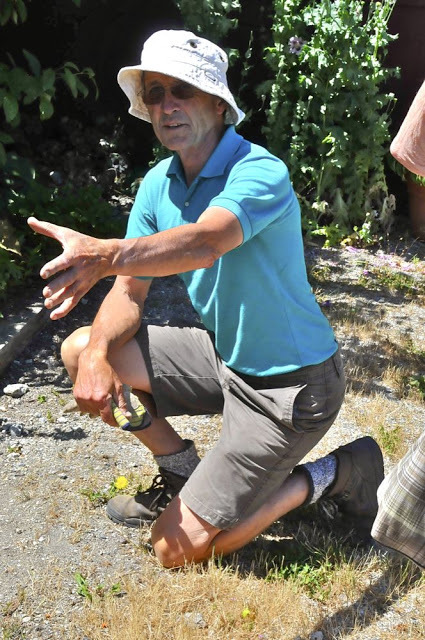 Along the dike path toward the Pumphouse, Roger showed off his Dodder and others took shots of other beaut flowers (see Picasa site). Several of our Delta Nats Bird Boxes along here were occupied with Tree Swallows. Tree Swallows and House Sparrows seemed to be jockeying for occupancy at the Pumphouse boxes. Gadwall and Mallards were the only duck species seen today in the sloughs. 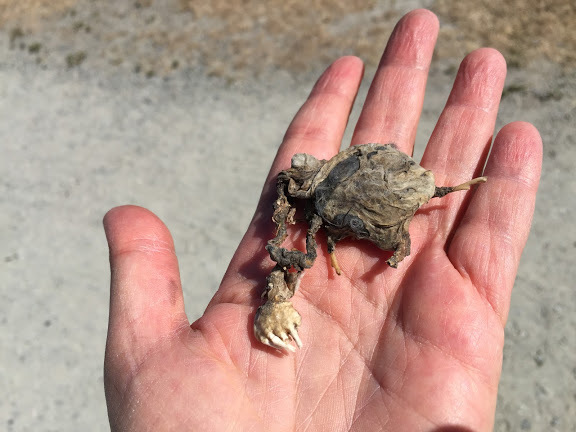 A withered up dead Mole found on the path was almost exciting. Killdeers were calling and we saw one being harassed by a crow in the marsh where they nest; hope its eggs are safe. We walked back to CH on the inland trail. 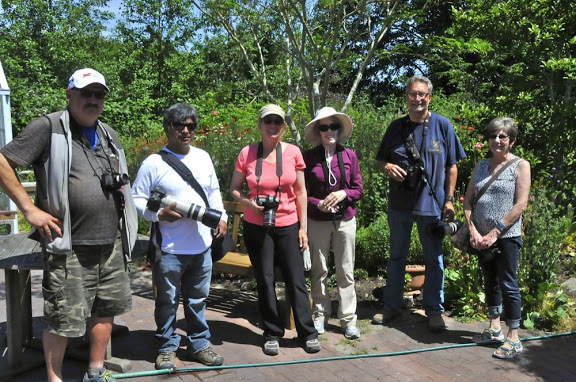 Some saw Northern Flickers, Downy Woodpeckers, Rufous Hummingbirds, Eurasian Collared-doves and Cedar Waxwings. Most saw nothing, but had a ball chatting with their new friends about their super sightings on other outings. We got back to CH, on time, at 11:30 a.m. where the Delta Nats Ladies Jennifer, Eleanor, Elizabeth, Rochelle (and Don), Sandra (and Ontario friend Susan) met us with their array of delectable home-made scones, cookies, egg sandwiches and fruits and cheeses. As always, the goodies were wolfed down with not unexpected vigor. Another awesome DNCB outing. This Wednesday, June 17, we will meet at and leave from Petra’s at 7:30 a.m. on an outing to Pitt Lake. We expect to be in the Pitt Polder Park parking lot (love those alliterations) before 8:45 a.m. to meet others. See GOOGLE map here. 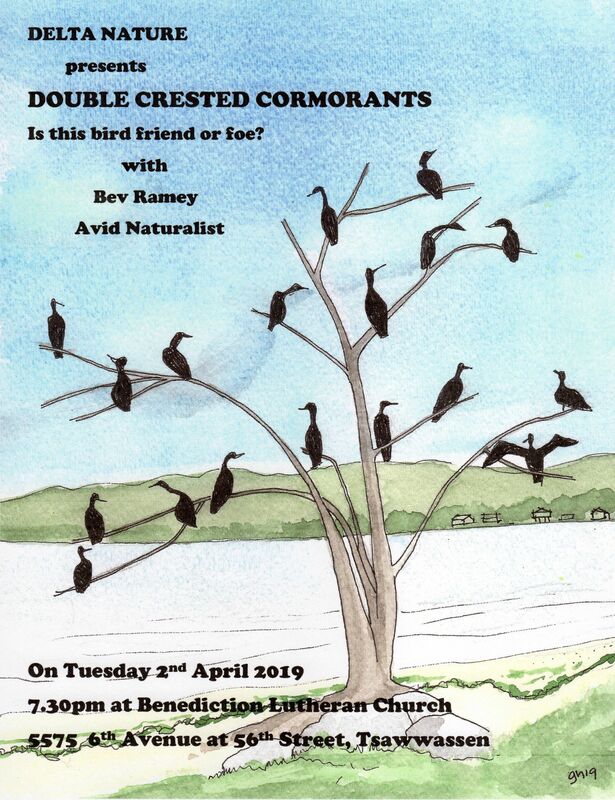 The 33 participants were: Guru Anne M, Roger, Terry, Ken & Anne, Rob & Marylile, Liz, Glen, Jim R, Jim K, Hans, sisters Pat & Maureen, Pascale & Alberto, Wayne, Otto, Elizabeth, Don & Rochelle, Eleanor, Jennifer, Sandra, Ontario visitors Brian & Susan, Janet, returnees Joan and Liz, newbies Claire and Chris, and me. After the Cammidge House goodies, some of us decided to check out the nest-cams at Earthwise Society Farm down the road. We were told by Earthwise guide Dave that both Barn Owlets were active on Tuesday, but nothing was visible today (Wednesday). However, there was one active Barn Swallow nest in the barn (using a premade nest), and two outside. We watched Northern Harriers/Red-tailed Hawks harassing a Bald Eagle, and Northwestern Crows harassing the Hawks. The Earthwise gardens were in full Spring bloom. 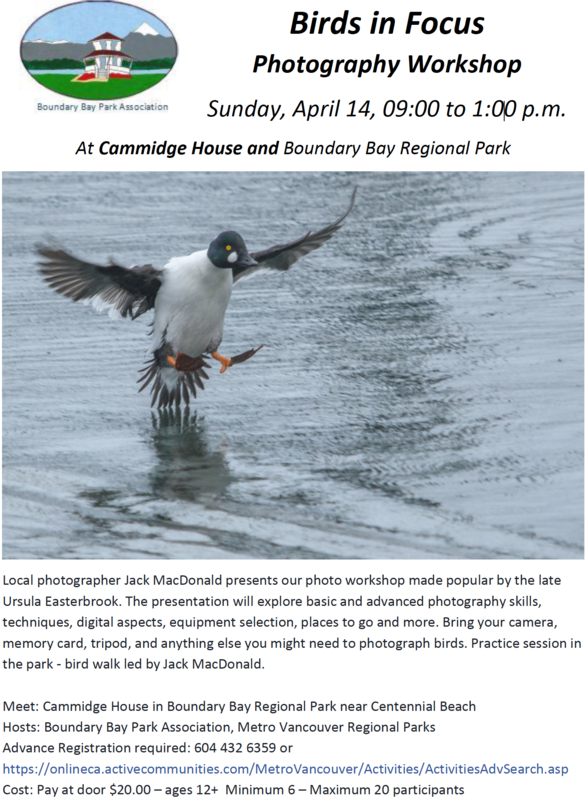 This entry was posted in *DNCB, Bald Eagle, Birds-on-the-Bay, Cammidge House, Centennial Beach. Bookmark the permalink.